Smith who teaches English 1 and Spanish 1 at EHS graduated from Clarkdale, attended Meridian Community College and MSU Meridian before receiving a master's degree at the University of Alabama. Smith also returned to school and earned a certification to teach Spanish. She has been teaching for six years, the last three at Enterprise. A letter nominating Smith for the award praised her abilities, describing her as a young teacher on fire – one who is the first teacher at school every morning and works without stopping until she leaves, carrying home a bag full of essays and class work to grade nearly every night. "She has drastically improved the English program at our school and all freshman and classes she has taught has scored significantly higher on the English II state test than any previous class at our school," the letter said. "This teacher has a passion for Shakespeare and she does everything she can to instill that passion in her students – this year taking all of our freshman to Montgomery to see Romeo and Juliet performed live." "This is the first field trip I have planned – I always said if they ever perform Romeo and Juliet I will have to take my kids," Smith said. "We read the play, but plays aren't intended to be read, they are intended to be watched. "It's going to be really exciting for me to see their reactions and how they actually get to interact with that art." 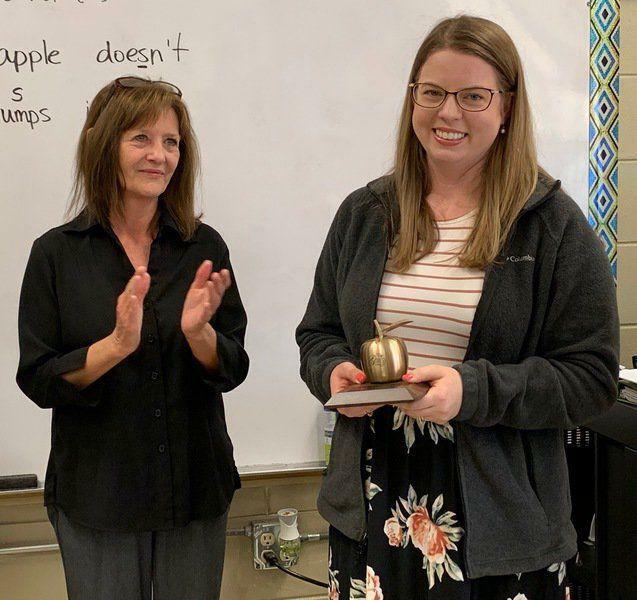 Freshman students Jenna Kasselman and Reagan Dyess called Smith the perfect recipient for the Golden Apple Award. "I am so happy she won it and I think she is one of the best teachers I have ever had," Kasselman said. "She explains things thoroughly in a way you can understand. "I am extremely excited to go see Shakespeare. I feel like watching the play will be a completely different experience than reading it. I will get a better grasp on the characters emotions." "She really deserved it and is a good teacher," Dyess said. "I've always been into English and really good at writing essays, and Mrs. Smith was able to help me exploit that a little better than I could before. She's really good at explaining things." Smith said she knew in high school she wanted to be an English teacher. "I knew in seventh grade I was going to be a high school English teacher," Smith said. "I got out of P.E. because I was not athletically inclined, so my principal at Clarkdale put me in Leigh Ann Smith's English class. I fell in love with what she did and watched what she did. "I knew then that was what I was going to do." 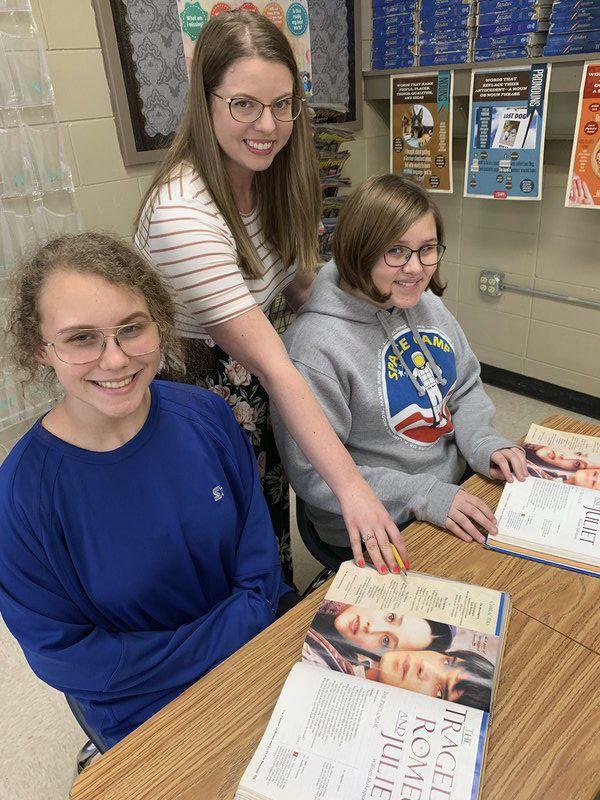 Amber Smith, the Golden Apple Teacher for March, looks on while Enterprise freshman students Reagan Dyess and Jenna Kasselman read the story of Romeo and Juliet by William Shakespeare. Smith said she chose Spanish to teach because it is a language she took in high school and enjoyed. "Any foreign language is a good one to learn, but especially Spanish because it is commonly spoken now, and makes a student well rounded to have exposure to another language. "When students learn another language it sometimes reinforces those English rules and really increases mastery of both languages. "They really flatter each other." Enterprise senior Jessica Bihn and junior Grace Leder both agree Smith makes learning Spanish very enjoyable. "I like the hands-on practice, all the practice sheets help me learn the words and how to use them," Bihn said. "I think learning Spanish gives you more opportunities in life, it can make travel easier or give you an edge when applying for a job. "I enjoy how the lessons are set up, leaning the basics first," Leder said. "I enjoy the practice sheets and interactions with the class because they help a lot with understanding the structure of sentences. "I think it is important to learn Spanish because you may need it in situations later in your career." Smith said what she enjoys most about teaching – there's something new every day. "Teaching is never going to get old, especially working with teenagers, they are fun and can be a challenge sometimes, but they are fun to work with. "Especially teaching English, we get to explore literature and really get to know each other through their writing. "When students have a relationship with their teacher they know this person wants me to be a better person. This is art imitating reality and she wants me to grow from this. I think when students understand that they want to perform better." What does she want her students to remember about her? "That, someone, thought I can learn from everything around me. I can learn from the art around me and invest in that art, I can create that art myself. I can put my expression in writing or into something. I can make something of my own and analyze what's around me and apply it to my life and put it out there for someone else to enjoy. "We need to remember art is what makes us human," Smith said.